India, May 17, 2017: Zebpay, an app-based bitcoin exchange, today announced achieving 500,000 downloads on Android Play Store. The present milestone highlights growing acceptance of Bitcoins as one of the most popular emerging asset class. 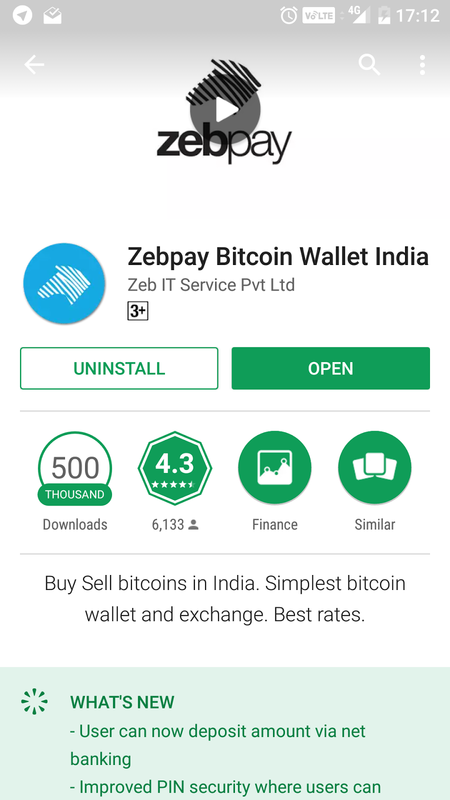 With over 500,000 downloads, Zebpay has become India’s largest Bitcoin exchange and is adding more than 2500 users every day. Ever since the launch in 2015, Zebpay has remained one of the most sought-after destination for investments in bitcoins. Zebpay was launched with an aim to simplify bitcoin trade along with providing a seamless experience to Indian audience. As per the recent reports, bitcoins remain as the most popular crypto-currencies across the globe with market capitalization of over US$27billion. Zebpay was started in 2015 by Mahin Gupta - a gold medalist in Computer Engineering. He is one of the first few pioneers to work on the blockchain technology in India since 2012. Two savvy businessman, Saurabh Agrawal and Sandeep Goenka joined Mahin as co-founders. Their aim was to bring financial freedom to billions of people in India. Saurabh Agrawal is the Founder and Chairman of Red Events - India's award winning event management company. Sandeep Goenka is former Jt-Managing Director of Hemlines, exporter to top 5 global retailers. He is also the founder of Blynk, hotel concierge app. Zebpay has the technical expertise to work on blockchain. It is the main technological innovation of Bitcoin and a rare commodity in this young industry. Zebpay has been voted as #1 new bitcoin company at CoinAgenda 2014, Las Vegas.